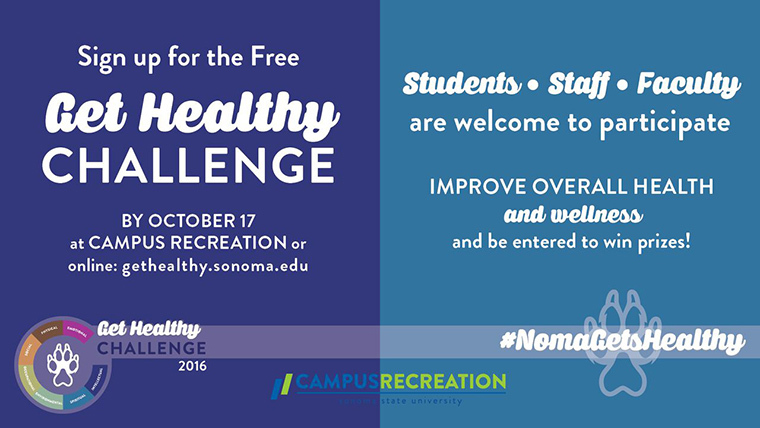 On Monday, October 17 the Get Healthy Challenge, hosted by Campus Recreation will kick off a free five week long health and wellness program. All Seawolves are welcome and encouraged to participate by signing up online by October 17. Signups will continue throughout the programs duration, but it is encouraged to sign up before the program kicks off. At Campus Recreation, wellness, sustainability and living a healthy lifestyle are all important, which has helped inspire the Get Healthy Challenge. According to Ryan Walsh, Campus Recreation General Coordinator, “the Get Healthy Challenge is a great way for people to both improve their individual wellness and a great way to increase awareness and knowledge about balance and healthy living.” The goal of the Get Healthy Challenge is to educate, motivate, and encourage students, faculty and staff to adopt a healthier lifestyle. Campus Recreation has the resources and support to help anyone achieve the goal of the challenge. There are also several opportunities to win prizes throughout the program. There are seven main types of wellness (listed below), which will be focused on during the 5 week program. Wellness is a term that encompasses all aspects of health. To be well is to be in touch with one's own needs, the needs of others, the community and the environment. All aspects of wellness will be tracked, especially exercise & fitness, nutrition, and event participation. Track your progress online through your individual profile. If learning how your own choices and daily routine can impact your overall health and wellness interests you, this challenge is for you! Be sure to use the hashtag #nomagetshealthy in all your social media posts about the Get Healthy Challenge. For more information, please visit the website or contact the Get Healthy Challenge team through the website, or visit the front desk in Campus Recreation for any general questions.